Integral card guides cast in, accept 1.5 mm (0.062”) P.C. cards. 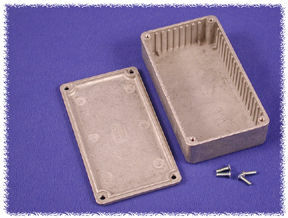 Also provides for improved EMI/RFI shielding. Painted version is painted with tough polyester powder paint for a lasting finish, even after machining. Four machine screws secure lid - into tapped holes.